Cheshire’s salt industry and its vital links to the region’s waterways will be celebrated this week when the Salt Towns’ Rally comes to Barons Quay on Thursday 23 August. 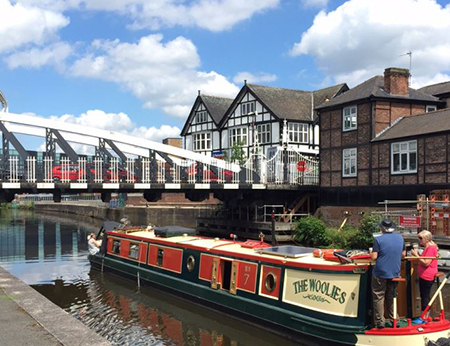 The second leg of the event, which has already visited Middlewich and will go to Winsford after Northwich, has been funded by the Northwich Business Improvement District (BID) and Barons Quay, with Northwich keen to honour its industrial heritage. The Hive and The River Weaver Navigation Society has teamed up to organise the event which is the first ever UK waterways’ boat rally to take in three events across three towns. The cavalcade of canal boats started gathering in Middlewich for an event between Friday 17 August and Sunday 19th August. After Northwich it will head to Winsford over the Bank Holiday weekend for the Offcut Festival. To celebrate the arrival of the boats in Northwich for the event, Barons Quay will feature an action-packed schedule of activities from 12pm - 7pm. Artists will perform throughout the day on a purpose -built stage, while kids will be entertained with a circus skills workshop, face painting and a mesmerising magic show. There will be plenty of food and drink available too. This family event is free for all, and one of the main event organisers, Damon Horrill, has spoken about why it has been organised and the importance of commemorating local history and heritage. “The idea of the three towns working together on projects such as this have been long discussed given the shared salt mining heritage and waterways linking Middlewich, Winsford, Northwich. Together the towns are known as The Weaver Valley. “With a music festival and plenty of activities for kids, as well as the spectacular sight of boats filling the River Weaver, it’s shaping up to be a great day out for all. Operations Manager of Barons Quay, Lina Higuita commented: “We’re delighted to have the opportunity to be involved with celebrating Cheshire's rich and local history. We can't wait to welcome families to this wonderful event on the day. For the latest information regarding the event, head to the official Facebook page.